This heirloom entertainment center is made by Amish woodworkers of 100% solid wood. Available in 3 sizes and 9 different hardwoods, you are sure to find the piece of your dreams. Customize further with the help of our variety of unique stain options. 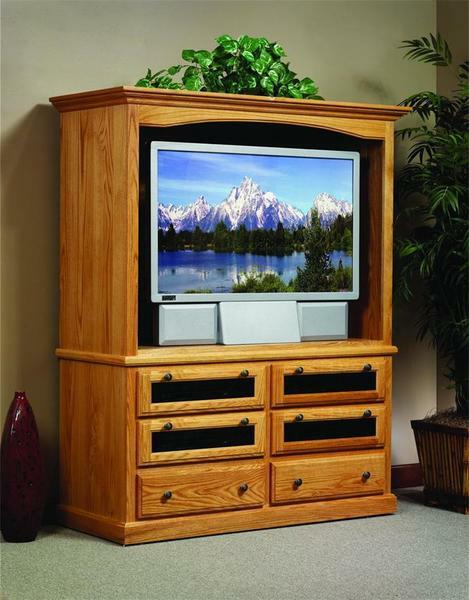 Our Amish Traditional Flat Wall HDTV Entertainment Center offers a variety of drawers for you to use with ease. We love the flip-out panels that allow you to keep your electronics safely stored away and ready to enjoy at any time. Bottom drawers make for excellent spots to store board games and cozy blankets for those chillier nights. A gently arched panel at the top and a carefully crafted base all reflect the supreme attention to detail that our dedicated Amish woodworkers are known for. Please get in touch with us today by calling 866-272-6773. We'd love to answer your questions about our Amish furniture.